What is the "New York Boating Safety Certificate"? Do I have to get the New York Boating Safety Certificate? Can I take an online safety course to get my certification? How do I get my New York Boating Safety Certificate? What is the minimum age to operate a powered vessel in New York? What is the minimum age to operate a Personal Watercraft (PWC) in New York? How long is the boat safety course and boater safety certificate good for? How much does the boat safety course cost? What do I need to pass the boater safety course? Can I review my Boater Exam answers? Are there Boater Exam practice tests or sample boater exam questions available? Is anyone exempt from getting the Boating Safety Certificate? Q. 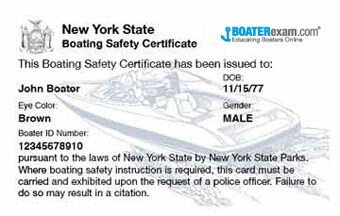 What is the "New York Boating Safety Certificate"? A. A. The New York Boating Safety Certificate (mistakenly referred to as the New York license) is proof of successful completion of an approved New York Safe Boating course. The Boating Safety Certificate must be carried with you whenever you are operating a powered watercraft to avoid high fines. Q. Do I have to get the New York Boating Safety Certificate? A. If you were born on or after May 1, 1996, you are required to successfully complete a state approved course and obtain a boating safety certificate to operate a motorboat. Additionally, all persons, regardless of age, must complete a Boating Safety Education Course in order to operate a PWC on NYS waters. The required boating safety certificate must be carried at all times while operating the boat. Q. Can I take an online safety course to get my certification? A. Yes. As of May 1, 2014, successfully completing the online BOATERexam.com® New York Boating Safety course will meet New York States mandatory education requirement for operating a motorboat for all individuals born on or after May 1, 1996. Q. How do I get my New York Boating Safety Certificate? Q. What is the minimum age to operate a powered vessel in New York? A. Individuals less than 18 years of age who have not successfully completed a boating safety course may only operate a vessel while under the direct supervision of an individual who is 18 years or age or older. Q. What is the minimum age to operate a Personal Watercraft (PWC) in New York? A. As of January 1, 2005 all personal watercraft operators must be 14 years of age or older and must successfully complete a Boating Safety Education Course to operate personal Watercraft in the state of New York. Q. How long is the boat safety course and boater safety certificate good for? A. The boater safety certificate is good for life. Q.What do I need to pass the boater safety course? A. You need a grade of 76% or higher on the boater safety course test to pass. That means 46 correct answers out of 60. A. Yes, once you have completed the boater safety course test and submitted all your answers they are graded immediately. You have the opportunity to review all your Boater Exam answers, whether you have passed or failed the Boater Exam. A. Throughout the boat safety course, you can take end-of-chapter-quizzes that prepare you for the final exam. These chapter quizzes are short boater exam practice tests that cover the same topics that are present in the boater safety course test. Q. Is anyone exempt from getting the Boating Safety Certificate? Police/peace officers, fire/rescue personnel and lifeguards acting pursuant to their assigned duties.